My boys absolutely loved robots as kids… and they’re still obsessed! These robot books for kids were right up their alley and will be a great match for your robot lover as well. 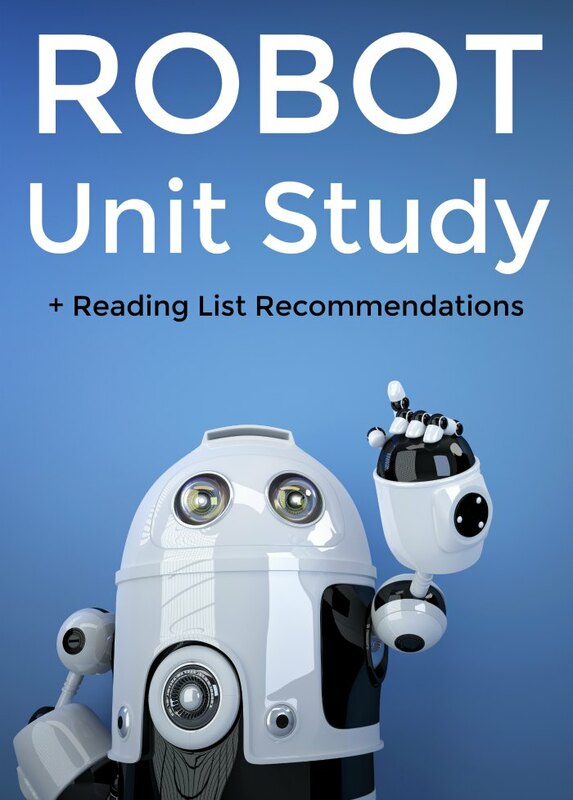 In addition to offering a reading list of robot books for, I’ve teamed up with some fellow bloggers to offer you homeschool and in-class learning robot unit study resources. You can find these books at your local library or purchase through the affiliate links provided for your convenience. 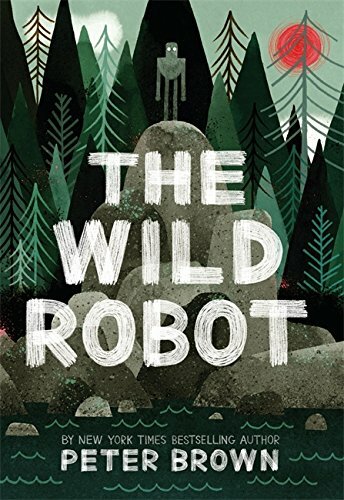 The Wild Robot: Wall-E meets Hatchet in this New York Times bestselling illustrated middle grade novel from Caldecott Honor winner Peter Brown. When robot Roz opens her eyes for the first time, she discovers that she is alone on a remote, wild island. She has no idea how she got there or what her purpose is–but she knows she needs to survive. After battling a fierce storm and escaping a vicious bear attack, she realizes that her only hope for survival is to adapt to her surroundings and learn from the island’s unwelcoming animal inhabitants. As Roz slowly befriends the animals, the island starts to feel like home–until, one day, the robot’s mysterious past comes back to haunt her. Robots, Robots Everywhere! 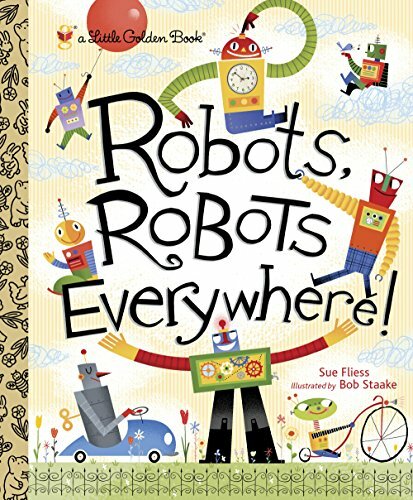 (Little Golden Book): Robots are everywhere in this bright and funny board book – and preschoolers are going to love it! Whether up in space, beneath the seas, or even under couches, award-winning illustrator Bob Staake’s bold and colorful bots make this book a must have. 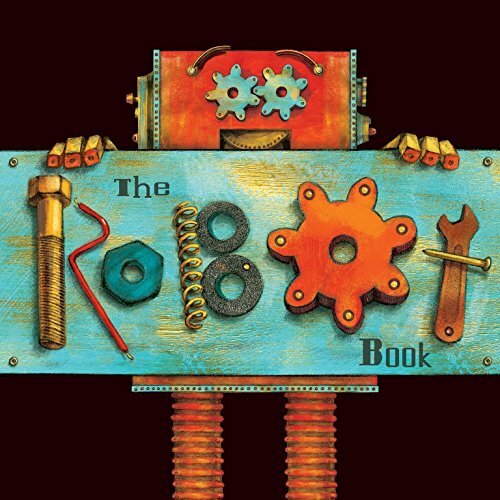 The Robot Book: Richly illustrated, sweetly written book answers the question: “What makes a robot tick?” Here’s a hint: It’s not what you think. 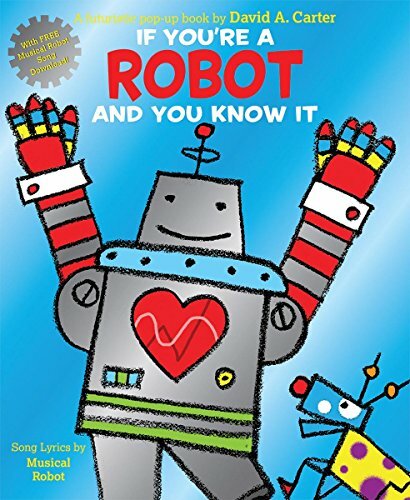 The Robot Book teams richly drawn illustrations and a whole lot of heart in a sturdy, toddler-friendly board book that will charm both little ones and their parents. It’s the perfect way for kids to learn that it’s what’s on the inside that really counts. 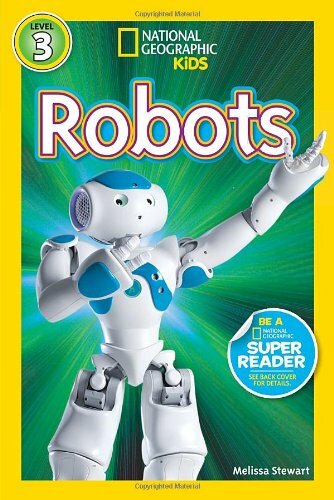 Robots (Scholastic Reader, Level 2): The world is being taken over by robots! There are robots that build towers, make cars, flip pancakes and play football. There are robots that travel deep under water, far into space, and into the most extreme danger zones. Some walk like a human, others fly like a bee, or swim like a turtle, or run like a dog. 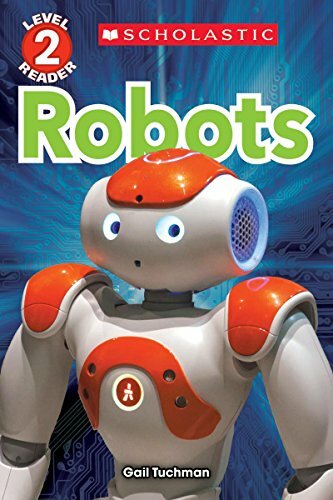 In this Level 2 reader, young readers will discover different kinds of robots: how they work, the jobs they do, and what exciting things they might do in the future. The book uses simple text and full-color photographs throughout. National Geographic Readers: Robots: Discover the coolest robots of today and tomorrow in this colorful, photo-packed book. In this inviting and entertaining format, kids will learn about the science behind these amazing machines. This Level 3 reader is written in an easy-to-grasp style to encourage the scientists of tomorrow! If You’re a Robot and You Know It: It’s the classic version of If You’re Happy and You Know It as you’ve never seen (or heard!) it before. Sing along to the free downloadable song by the dynamic Musical Robot team, then turn the pages as David Carter’s clever pop-ups show the robot characters going through all of the call-out movements, from clapping hands to shooting laser beams out of your eyes! 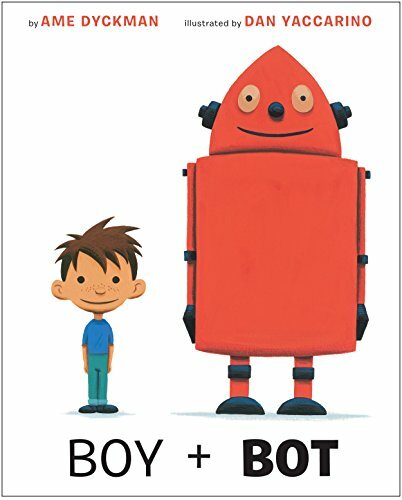 Boy and Bot: One day, a boy and a robot meet in the woods. They play. They have fun. But when Bot gets switched off, Boy thinks he’s sick. The usual remedies—applesauce, reading a story—don’t help, so Boy tucks the sick Bot in, then falls asleep. Bot is worried when he powers on and finds his friend powered off. He takes Boy home with him and tries all his remedies: oil, reading an instruction manual. Nothing revives the malfunctioning Boy! Can the Inventor help fix him? Using the perfect blend of sweetness and humor, this story of an adorable duo will win the hearts of the very youngest readers. 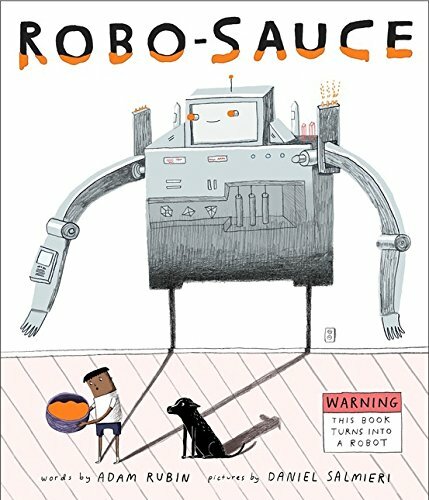 Robo-Sauce: Giggle at the irreverent humor, gasp at the ingenious fold-out surprise ending, and gather the whole family to enjoy a unique story about the power of imagination. FACT: Robots are awesome. They have lasers for eyes, rockets for feet, and supercomputers for brains! Plus, robots never have to eat steamed beans or take baths, or go to bed. If only there were some sort of magical “Robo-Sauce” that turned squishy little humans into giant awesome robots… Well, now there is. 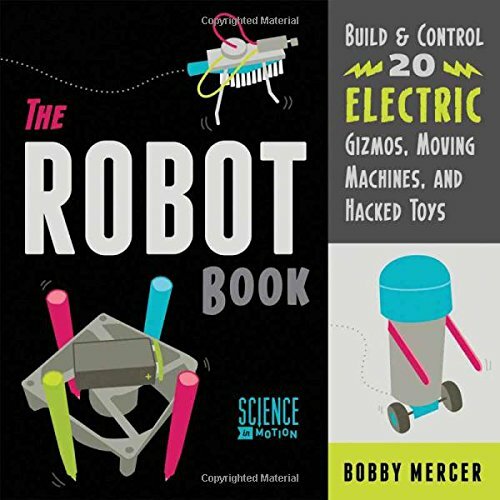 The Robot Book: Build & Control 20 Electric Gizmos, Moving Machines, and Hacked Toys (Science in Motion): Drones, RC cars, artificial limbs, Roombas—the robots have arrived! Don’t you want your own? Author and physics teacher Bobby Mercer will show you how to turn common household objects and repurposed materials into 20 easy-to-build robots for little or no cost. Turn a toothbrush, an old cell phone or pager, and scrap wire into a Brush Bot, or hack a toy car to hotwire a Not-So-Remote Bot. A small electric fan, several craft sticks, and rubber bands make a Fan-Tastic Dancing Machine, and drinking straws, string, tape, and glue can be used to construct a working model of the human hand. 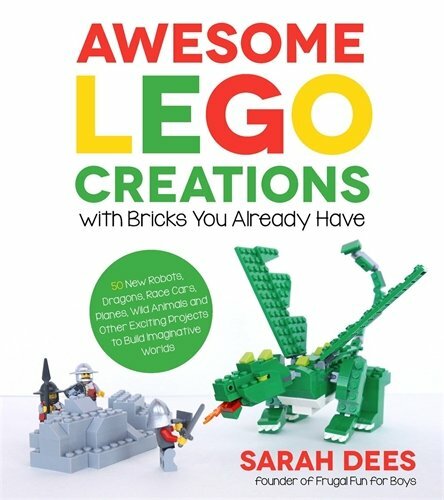 Awesome LEGO Creations with Bricks You Already Have: Turn your pile of LEGO bricks into a day of fun! This unique activity book has step-by-step instructions and tons of photos to teach you how to build all-new and totally awesome robots and a robot lab, race cars to race your friends and jet planes to zoom across the room at lightning speed or fit in your pocket for on-the-go play. You can build wild animals then take your minifigures on a safari to see a lion, tiger, monkey and more! Build your own LEGO town with a playground, skate park and go-cart entertainment arena. Your knight minifigures will have a real adventure when they encounter a green fire-breathing dragon! Help the knights win the battle by building a catapult and a crossbow that really work. 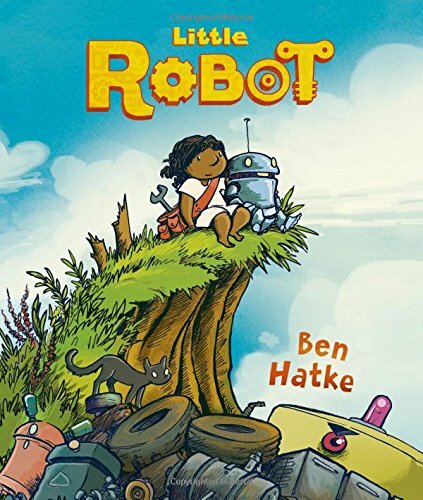 Little Robot: In the Eisner-winning graphic novel, Little Robot, New York Times Bestselling author Ben Hatke brings his signature sweetness to a simple, moving story about friendship and overcoming fears that will appeal to readers of all ages. When a little girl finds an adorable robot in the woods, she presses a button and accidentally activates him for the first time. Now, she finally has a friend. But the big, bad robots are coming to collect the little guy for nefarious purposes, and it’s all up to a five-year-old armed only with a wrench and a fierce loyalty to her mechanical friend to save the day! Like these robot books for kids? Find even more engaging book lists for kids with more than 100 book-themed reading lists! Ready to get your kids playing with robots? Try these fun options! 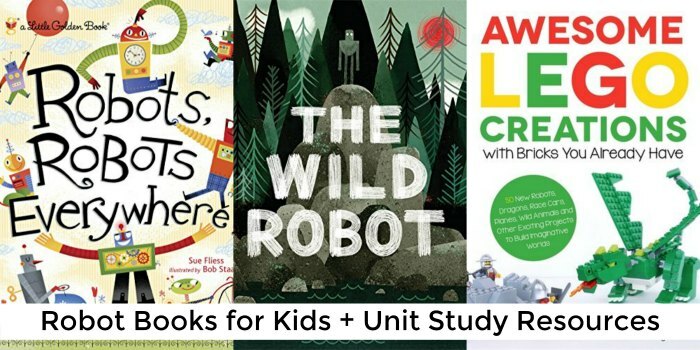 In addition to offering a reading list of robot books for kids, I’ve teamed up with some fellow bloggers to offer you homeschool and in-class learning robot unit study resources. These unit study resources may contain affiliate links.